For once in a piece of animation, penguins are the bad guy. I guess given that the main character has crippled multiple dolphins for life, it’s really anything goes with this show. 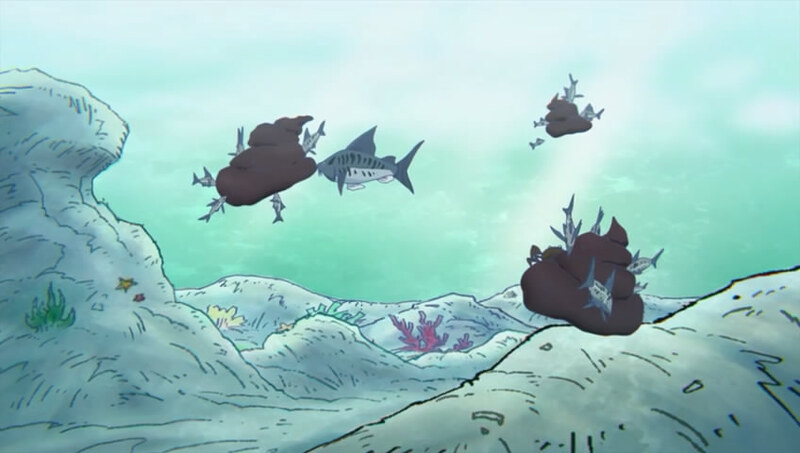 And hey, if it lets them draw a macross-esque underwater chase, who cares? That it made non-terrible poop jokes was another unexpected bonus. I think there’s something to taking the “I’m about to be eaten” thing a little too far, because there’s another sweet spot out there Muromi-san just hit. The advantage of a show playing running gags out is that it can flip them to get one last laugh before ditching them entirely, as this episode did in the bit where the seal wasn’t actually waiting for Muromi. Their dealing with the situation was very them in a slapdash sort of way. On another note, I feel a little sorry for her, not making any progress with Takuro and getting mauled by increasingly larger numbers of her natural predators. I didn’t realize the aliens in the opening would be actual characters. The most immediate bit of comedy I foresee from their appearance is the opportunity for the crazier members of the cast to play the straight-man role for once. This entry was posted in Anime, Finished and tagged Anime, Cruelty to Sea Creatures, Evil Penguins, First Reactions, Muromi-san, Namiuchigiwa no Muromi-san, Running Gags, Spring 2013, Spring 2013 Anime by torisunanohokori. Bookmark the permalink.